But casseroles don’t have to be that way. They don’t have to be awful, and tasty does not have to mean unhealthy. There is a way to make a casserole that will allow busy people to have it all: flavor, convenience, frugality, nutrition and excitement. The keys are a little time, patience, organization and focus. Choose a flavor profile or ethnic cuisine and let that be the unifying characteristic of your dish. Take this one: this casserole is inspired by the flavors of Italy with al dente pasta smothered in creamy spinach cheese sauce and topped with tomato or meat sauce, breadcrumbs and grated cheese before baked in the oven to bubbly gooey deliciousness. This is wonderful fresh, or reheated and will keep in the fridge for a week. 2 ½ Cups Grated Cheese, Divided – I used a mix of Mozzarella and Cheddar, but you could use Mozzarella and Parmesan or whatever other cheese you like, though stay away from anything too orange or too processed as it will throw off the flavor and texture. 1 Cup of Flavored Bread Crumbs – Italian flavor works best, but you can always add some basil, oregano, and a little parmesan cheese to plain ones if that’s easier. Fill the pot with water, stir in some salt, and bring the water to a boil. Put your strainer in the sink so it’s ready when you need it. Add the pasta and cook until al-dente, meaning that when you bite into a piece it’s still a bit chewy. Preheat the oven to 350oF and spray your baking dish with cooking spray. I recommend doing it at this stage as most ovens take a while to preheat. Dump the pasta into the strainer and get started on your cheese sauce. Using the same pot you cooked the pasta in, melt 2 Tablespoons of the butter on medium high heat. Add the flour and whisk together until it’s evenly incorporated and has slightly changed colour. This mix, called a “rue” in French cooking, helps thicken cream sauces. Add the milk and garlic and bring to a boil, whisking constantly. Add the pesto, grated cheese, and some salt though be gentle on the salt as pesto and cheese have quite a bit – if in doubt, taste it and adjust. Continue whisking until the sauce has thickened a bit so it lightly coats the spoon. Turn off the heat and stir in the spinach until it’s fully incorporated. Add the pasta and stir so the noodles are completely coated in sauce. Pour everything into the baking dish. 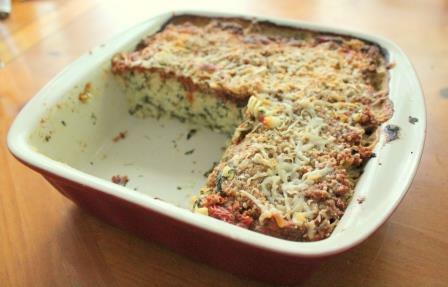 Cover with your favorite tomato or meat sauce and top with breadcrumbs and cheese. Let it rest on a trivet on the counter for 10 minutes before serving.